“I didn’t want to get sprayed,” he joked. 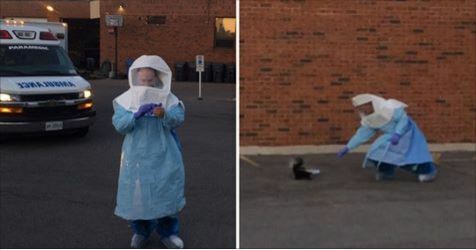 He said he and his partner spotted the trapped skunk at the beginning of their shift in a parking lot, and while they wanted to free it, he didn’t want to ruin the uniform he would wear the rest of the day. The task to remove the cup from the skunk’s head seemed simple, but Mausz ran into some moments of panic.